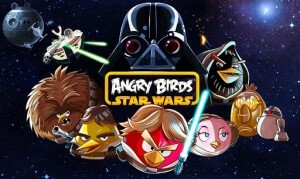 Within hours of its launch yesterday, Angry Birds Star Wars has become one of the most popular games in the online world and is set to become the top paid for app on ipads and iphones. I generally don’t write game reviews, but being a Star Wars fan myself, this one is too good to resist and deserves a mention, not just for the Angry Birds fans but for Tablet users too. 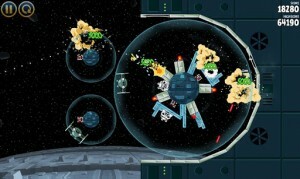 The Angry Birds Star Wars is not a random inter-galactic Bird slinging game, but an engaging story of a group of Rebel Birds, cute adaptations of the movie characters of Luke Skywalker, Hans Solo and Chewbacca, who are up against the might of the Empire’s evil Pigtroopers. In a 80 level journey starting from Tatooine, the desert planet on which the rebels survive, gamers can now use new weapons like Lightsabers, Blasters and Jedi powers to overcome Imperial pigs, Tusken raider pigs, Laser turrets and the Dark side of the force. The final objective is ofcourse a mouth watering encounter with Darth Vader, Dark lord of the pigs and the fight to restore freedom to the galaxy. Bonus levels involving bird characters like R2D2 and C-3PO need to be unlocked and Golden eggs need to be collected. The game involves lots of tricky levels and hours of interesting challenges that are completely new, unlike any others you might have seen in the earlier Angry Bird games. Another feature is the Mighty Falcon, which needs to be paid for on Use basis. 20 Uses can be bought for $ 1.99 and it helps you unleash destruction and unlock new goals and achievements. All in all, a great game for not only Angry Bird fans and Star Wars enthusiasts but for all Tablet users as it suits the touch screen interface perfectly and will provide lots of fun. Angry Birds Star Wars can be purchased from the Google Play Store for $0.99 on iPhone and Windows Phone 8, $2.99 on iPad and Kindle Tablet, $0.99 on PC and $4.99 on Mac and is available for free download on Android supporting devices. By bringing together Angry Birds and the epic Star Wars series in a single action packed game, Rovio, the Finland based developer of Angry Birds has managed to capture the attention of not only video game fans but also movie buffs. This will eventually result in evolving interest in the Star Wars franchise for Angry Bird fans and vice-versa. A win-win situation for both.